Several versions of the windows operating system exist. Today’s most common ones are Windows XP, and the newer Windows Vista, which one can find in both Home, or Professional Versions. One can find other operating systems, however they are outside of the scope of this site. For the brand new computer user, it will help to draw a simple comparison. Your computer is organized, and works just like You work and organize your Office. You are the operating system (Windows XP), and your computer is your Office. In your Office you have different office rooms (windows) a desk (your desktop), office machines such as telephones, fax machines, photocopiers (applications), filing cabinets (folders) and papers (files). Just as you know your way around the office, we will show you the way around your computer. 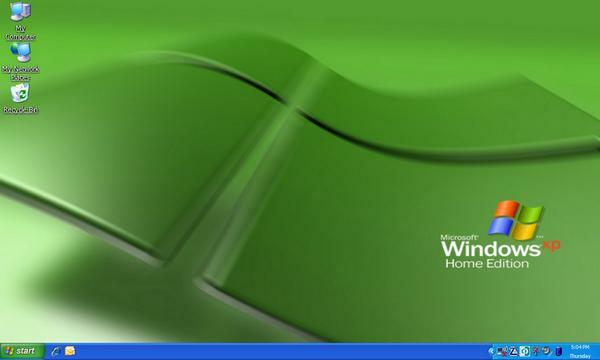 Windows XP-Home or XP-Pro is an operating system that works in different windows, hence the name. There are 2 components or zones that you will work with. the desktop and the toolbar. The windows system is mainly operated through the mouse . In this zone, you will find all the icons that represent the different programs, applications, folders, or short-cuts. The tool bar is located at the very bottom of your screen by default. The Start button is at the bottom left. The icons on the far right are icons representing applications that are continually running. Between those two areas, hence in the middle, are rectangular shapes. These represent applications that are running, or pages that are open. The mouse has three buttons. 1 click will select an icon, and will highlight it. It can also execute an application if it is already open. 2 quick clicks which are called the Double Click allow you to launch an application. This opens a menu that lists all the options that you can apply directly to the icon or program or folder that you right clicked over. The wheel will be active depending on the application. Generally speaking, it will permit to Scroll up and down inside an open window. In certain applications, like inside your internet browser, you can click down on the wheel, which will open this double arrowed icon which allows you to simply slide your mouse up and down a page for it to scroll up or down. The behaviour characteristics can be changed in the control panel. By clicking on the start button,you will arrive at the heart of the Windows XP system. From here you will control everything. This menu has 4 Zones. 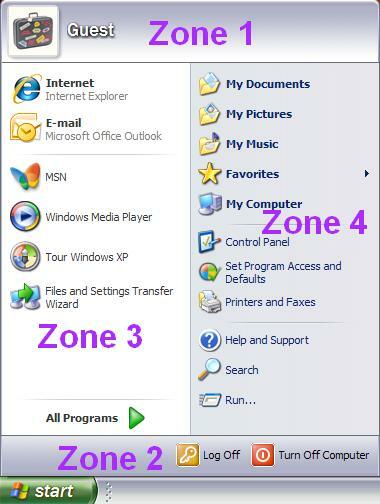 Zone 1 At the very top, is the identification of the current user. Zone 2 At the very bottom you will find the buttons to shut the computer down, or to log off. Zone 3 The left side has three different areas that are separated by lines. Area 1- Shows your internet connection browser, and email client. Area 2- Shows a list of your most used programs. Area 3- "All programs", opens a new menu that lists all the programs that are installed on your computer. Zone 4 The right side, which also has three areas. Area 1- opens various windows (using windows explorer) in which you can explore your computer. Area 2- deals with Windows XP settings and tweaks.